After her first husband died in 1632, my 11 x great grandmother, Ariaentje Cuvilje Vigne, who gave birth to Jan Vigne, the first European male child born in Manhattan, married Jan Jansen Damen. He was the first owner of the World Trade Center site owning 70% of the land above the water. He got the land grant on April 25, 1644. When he died childless in 1651, Ariaentje was his sole heir and became the second owner of Ground Zero. The maps show their land in red. It was on both sides of Broadway north of Wall Street stretching from the Hudson almost to the East River. Their land, comprising over 20 square blocks, was the site for AT&T's original Headquarters, Federal Hall, the Federal Reserve Bank and several major skyscrapers. The bottom map is from the "Iconography of Manhattan Island" (Vol. 6, page 64i). Compare these maps [red area] to a map [shaded area] of New Amsterdam in 1660. 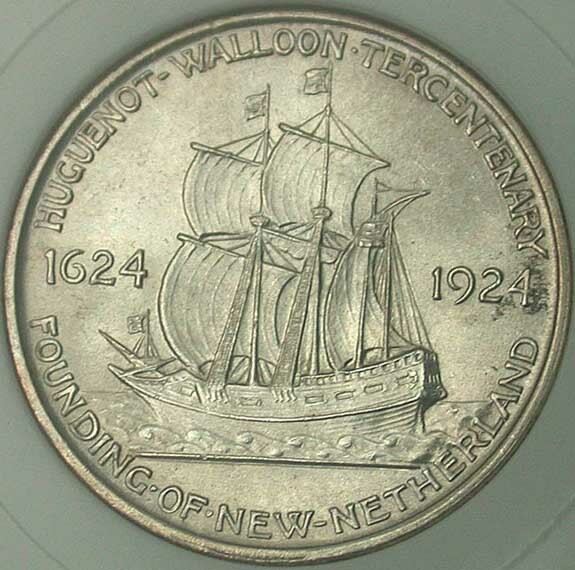 The reverse of the half dollar minted in 1924 to honor the tercentenary of the arrival of the Huguenots and Walloons who founded New Amsterdam. My eleven times great grandparents, Ariaentje Cuvilje and Guleyn Vigne, were Walloons who fled religious persecution in Valenciennes, which was then in the Spanish Netherlands and today a city in France. It can be confusing reading the references below since there are a dozen variations of their names, e.g., Adrienne Cuvellier and Ghislain De La Vigne. 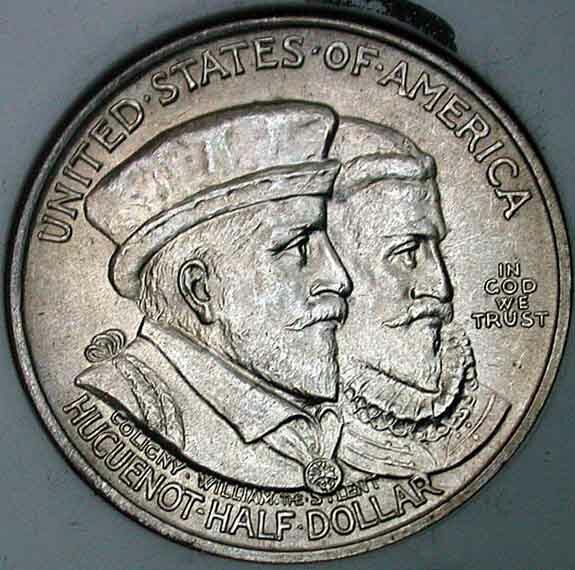 The obverse of the 1924 half dollar. All of the references below are unanimous in the conclusion that Jan Vigne was the first European male born in New Netherlands, but there is a difference of opinion on whether he was born in 1614 or 1624. Recent scholarship has established that 1624 is the correct date because of the corroborating evidence that the Vignes lived in Leiden from 1618 before coming to America with other religious refugees in 1624. Vigne Family Notes Covers some of the same information, but some new items. Jan Damen Reference Comments on Jan Damen with reference to his parents. Magdalena Dircks Discussion of Vigne-Damen family disputes and wills. Research Notes 1650 to 1699 Document references. A mention of Damen & wife. Map of New Amsterdam in 1660 Compare the shaded area to red areas in maps above. WTC Archaeological Study Jan Damen mentioned as owner on page 5 with references. Descendant Thomas Edison 8 Generation Descent from Ariaentje & Guleyn Vigne. Descendant Eleanor Roosevelt 10 Generation Descent from Ariaentje & Guleyn Vigne. Descendant Franklin Roosevelt 10 Generation Descent from Ariaentje & Guleyn Vigne. Descendant Theodore Roosevelt 9 Generation Descent from Ariaentje & Guleyn Vigne. 2004 New York Times Article Eric Lipton article on the history of the Ground Zero site. 2002 New Yorker Article Article incorrectly identifies the first owner of Ground Zero. On September 10, 2004, the New England Historic Genealogical Society, the oldest genealogical society in America, published this article in their eNews Vol. 6, No. 37 commemorating the third anniversary of the terrorist attack on America. 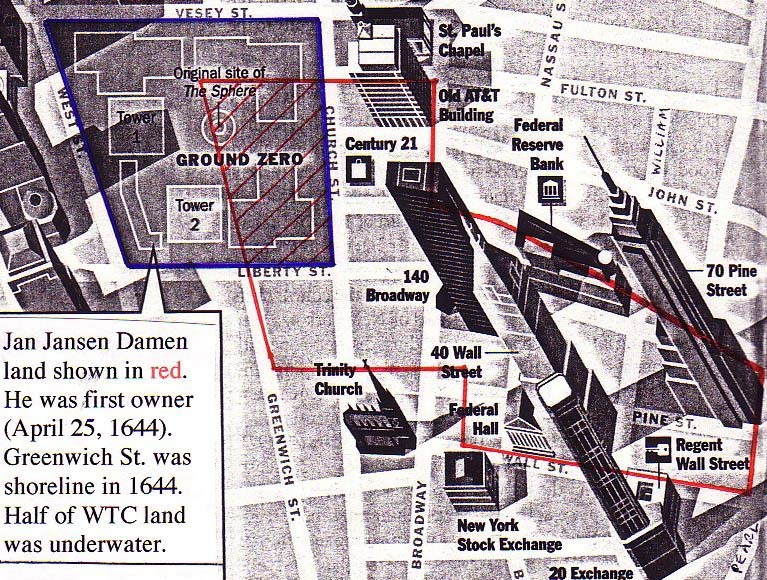 On April 25, 1644, Jan Jansen Damen, a prominent leader of the Dutch colony, received a land grant in lower Manhattan from Wall Street north to Fulton Street and from the Hudson River to almost the East River. In today's terms it is more than twenty square blocks. Jan owned about seventy percent of the World Trade Center site above the water (Greenwich was the shoreline then) and the West India Company owned the rest. This is documented in Iconography of Manhattan Island (vol. 6, pp. 86, 64i [map]). See a map of the site and additional references online at: MapGroundZero.html. My eleven times great grandparents, Ariaentje Cuvilje and Guleyn Vigne, were Walloons who fled religious persecution in Valenciennes, which was then in the Spanish Netherlands and today a city in France. They arrived in Leiden in 1618 when this tolerant Dutch city was also giving refuge to the Pilgrims. The Vignes sailed to New Amsterdam in the spring of 1624 on the Eendracht or Nieuw Nederland, the first two ships with colonists. Their son, Jan Vigne, was the first male child born in Manhattan. Their descendants include Theodore Roosevelt, Franklin Delano Roosevelt, Eleanor Roosevelt, and Thomas Edison. After Guleyn died in 1632, Ariaentje married Jan Jansen Damen who was about twenty years her junior. This marriage consolidated their adjacent land holdings that are worth billions today. Ariaentje was called the "Matriarch of New Amsterdam." An article by that title appeared in the National Genealogical Society Quarterly, 35:65-69 . It even describes the incident after a preemptive battle against the Indians when she "amused herself in kicking about the heads of the dead" [Indians]. When Jan died childless in 1651, Ariaentje, as his heir, became the second owner of Ground Zero. She died in 1655. Now three years after the terrible attack of September 11, 2001, construction has begun anew on this hallowed ground. Many surprising and amazing things have occurred on the Twin Towers site since the Damen land grant. A June 2004 article by Eric Lipton, a New York Times reporter, surveying three and a half centuries of Ground Zero history is online at: http://www.nytimes.com/2004/06/27/nyregion/thecity/27feat.html (registration and fee to view required). Here is an example of what can be found in the court record on Jan Jansen Damen. This minor entry gives a good insight into his character and to the culture of the early Dutch colony. There are only a few hundred people in Manhattan in 1640. Life is tenuous, but still remarkably organized. In spite of the passage of over 360 years and being translated, the economy of language of this declaration retains its fundamental moral force. A child has been orphaned, and Jan Jansen Damen and David Provoost pledge to the court to be his guardians. "We the undersigned, David Provoost and Jan Jansen Damen, chosen this day guardians of Jan van Vorst, promise as honest and honorable men that we shall administer and dispose of the means, effects and patrimony of the aforesaid Jan van Vorst as faithful and upright guardians are bound to do with property of orphans. Furthermore, that we shall use our diligence to collect all debts and claims which the aforesaid Jan van Vorst may have elsewhere; that, as guardians, we shall earnestly take the same in hand and prosecute and argue his case before all courts, judges and justices to final determination, whether as plaintiffs or defendants. For which we bind our persons and property, movable and immovable, present and future, without any exception. Done this 27th of January 1640. Copyright © 2001 Donald M. Parrish, Jr. All rights reserved.